Founded in 2002 by Attorney Darren A. Miller, our attorneys and staff work to ensure that justice is served. Together, we have the experience and legal knowledge to fight on your behalf. D Miller Law offers prospective clients a free initial consultation to help them better choose which course of action will best serve their needs. Our personal approach and friendly environment means thatYou win with us! When Should You Hire A Lawyer? Anytime you or a loved one have been injured as a result of anothers negligence, it may be in your best interest to hire a Personal Injury Lawyer to protect your legal rights. If your injuries require medical care or long term treatment, result in permanent impairment, or a loss of income, you may be entitled to compensation. Because of our free consultation offer, you will find out instantly if you may have a valid claim. The attorneys of D Miller Law will take your case on a contingency basis so you pay no legal fees unless you recover money in a court decision or settlement. Personal Injury A personal injury occurs whenever someone has been harmed through the carelessness or neglect of another that may be held legally responsible for that harm. The more common types of personal injury cases are auto accidents, 18-wheeler accidents, slip and fall accidents, medical malpractice, and wrongful death. You may also be entitled to damages if you were injured as a result of using prescription drugs, over-the-counter drugs, or medical devices which have been shown to be defective or dangerous. Personal injury disputes are sometimes resolved through settlement talks between the parties involved and led by your attorney. This negotiation will often include a payment of funds agreeable to both sides and a written agreement to not pursue a lawsuit or any other further action. Another option is to file a civil lawsuit with the help of your attorney against the individual, business or agency that is alleged to have caused harm. If it is determined that you or your loved one might have a personal injury claim, your personal injury lawyer will advise you on how the case should be handled and keep you informed throughout the process. Your personal injury team will work with you to get the best compensation possible for your injury claim. Your damages may not only include medical expenses and lost wages but also compensation for physical pain and mental anguish. There are many types of personal injury including: Auto Accident Brain Injury Birth Injury Burn Injury 18-wheeler Accident Motorcycle Accident Slip and Fall Accident Wrongful Death Medical Malpractice Workplace Accidents Dog Bites Defective Drugs Medical Devices Our History Fighting for Your Legal Rights We were one the first law firms helping the victim of the Texas City BP Oil Refinery explosion of 2005. Today we represent hundreds that were negatively impacted because of the 2010 Deepwater-Horizon explosion and the resulting BP oil spill in the Gulf of Mexico. Our firm stands for the rights of those whose lives are seriously affected as a result of defective drug and medical device manufacturers. Our history of successful results combined with our willingness to fight hard for our client rights means that your case is in experienced and caring hands. Led by a skilled team of Attorneys who practice both in and out of the courtroom, the Texas personal injury firm of D. Miller & Associates, PLLC is becoming not only a leader in personal injury and accident cases, but is also a nationally known law firm devoted to fighting for civil justice for the victims of defective pharmaceutical drugs, medical devices and any dangerous product that may cause serious and life-threatening injuries. You Win With Us! Since 2002, the mission of the Accident and Personal Injury Lawyer team of D Miller Law based in Houston, Texas has been to protect the rights of seriously injured people, as well as to protect the families of loved ones killed by the negligence of others. Our lawyers have years of experience, vast knowledge, exceptional skills, and a diligence that ensures that we are prepared to take legal action against even the most powerful defendants to protect your rights under the law. You win with us! Our accident and personal injury lawyers are fully committed to obtaining justice for our clients by providing aggressive legal representation. In recent years, the law firm has emerged as one of the premier national law firms specializing in Personal Injury, Defective Drugs, DWI and Criminal Law. Whether your case involves brain injury, a vehicle accident such as motorcycle, an 18 wheeler accident, or auto accident, burn injury or other type of personal injury, the experienced team at D. Miller & Associates, PLLC will work hard for you. Auto accidents can cause serious personal injury and even result in wrongful death which is why you need a skilled car accident lawyer. A Texas car accident lawyer fights the Insurance company for you, and we can help you get results. Based in Houston, Texas the legal team at D. Miller & Associates, PLLC represents hard working men and women throughtout the United States. Founded in 2002 by Attorney Darren A. Miller, our attorneys and staff work to ensure that justice is served. Together, we have the experience and legal knowledge to fight on your behalf. D. Miller Law offers prospective clients a free initial consulatation to help them better choose which course of action will best serve their needs. Our personal approach and friendly environment means that "You Win With US"! We also have Spanish Speaking Staff that can help you also. D. Miller & Associates, PLLC announces their free Accident Assistance App for iPhone and Android phones. Accidents can happen at anytime and when you least expect them. Be prepared before an accident by downloading our free Accident Assistance App now. Our Accident Assistance App has many features that you and every driver in your family will find useful. Capture details of accident including photos and video Contact emergency assistance Call for a tow truck Know what to do after the accident Document Injuries Accident checklist Contact auto repair shops Free phone consultation with our accident legal team Free case evaluation The D. Miller & Associates, PLLC free Accident Assistance App for iPhone and Android phones guides you through the steps needed in order to document the accident, injuries, interview witnesses, and easily contact emergency assistance. Download our free app now and you will be prepared in the case of an accident. Please visit our website http://m.dmillerlaw.com to get your free accident app. Personal Injury is part of a large area of the law known as torts. Torts include physical, mental, or emotional damage done to another for which damages may be assessed, including wrongful death. Based in Houston, Texas, the legal team at D. Miller & Associates, PLLC represents hard working men and women throughtout the United States. Founded in 2002 by Attorney Darren A. Miller, our attorneys and staff work to ensure that justice is served. Together, we have the experience and legal knowledge to fight on your behalf. D Miller Law offers prospective clients a free initial consultation to help them better choose which course of action will best serve their needs. Our personal approach and friendly environment means that You win with us! We have Spanish Speaking Staff to help with your needs. Truck accidents and the resulting lawsuits differ from standard car accident cases as they may involve corporate interests and federal regulations. Hiring an experienced truck accident lawyer is key as there are often many complicated legal issues. Wrongful death claims are filed when someone dies due to the negligence or intentional act of another person, company or organization. Examples of wrongful death cases include fatal car accidents, product liability, or medical malpractice. Based in Houston, Texas, the legal team at D. Miller & Associates, PLLC represents hard working men and women throughout the United States. Founded in 2002 by Attorney Darren A. Miller, our attorneys and staff work to ensure that justice is served. Together, we have the experience and legal knowledge to fight on your behalf. D Miller Law offers prospective clients a free initial consultation to help them better choose which course of action will best serve their needs. Our personal approach and friendly environment means that You win with us! We also have Spanish Speaking staff to help with your needs. D. Miller & Associates, PLLC, based in Houston, Texas, has developed a reputation as a national law firm that can be counted on to handle all your legal needs. Founded by Attorney Darren A. Miller, we have successfully represented clients since 2002. Contact us today for your free, confidential initial consultation. It will cost you nothing to find out whether your situation requires the assistance of an attorney. In fact, in certain personal injury cases fees are on a contingency basis which means that the attorneys at D Miller Law do not receive their fee unless you recover money in a court decision or settlement. If for some reason your claim would not be handled as a contingency case, all fees and costs will be discussed before any legal work begins. The experienced attorneys and staff at D. Miller & Associates, PLLC are fully committed to obtaining justice for our clients by providing aggressive legal representation. For a free and confidential consultation, fill out our online case evaluation form or call us toll free at: 1-855-PRO-LAWYERS. Protect yourself by consulting an experienced Texas personal injury lawyer who can help put a dollar value on your loss. You are entitled to compensation for your medical expenses, lost wages, and other expenses. You may also be entitled to claim compensation for any pain, disfigurement, physical damage, embarrassment, lost of enjoyment of life, mental distress, emotional pain, and other psychological injuries. The attorneys and staff at the law firm of D. Miller & Associates, PLLC are fully committed to obtaining justice for our clients by providing aggressive legal representation. Our law firm approach to client service is guided by the following principles: We will evaluate your case with a free personal injury consultation. We strive to return phone calls on the same day they are received. Most personal injury cases are handled on a contingency fee basis. We offer same-day appointments and will begin working on your case immediately. If necessary, we will make appointments at your home or hospital. We will not keep you waiting. Personal injury cases are governed by many complex federal and state laws. These laws are designed to protect the individual from the negligence or deliberate harm of others and to provide recourse in the event of injury. Because these laws vary from state to state, they can be very difficult to interpret. Your personal injury lawyer can help you determine your legal rights, give you examples of personal injury settlements and explain your chances of receiving compensation for your losses. At D. Miller & Associates, PLLC , we fight hard to resolve your personal injury case as soon as possible, and we will do everything in our power to make sure you get the compensation you deserve. If you've suffered a personal injury, you need our experienced personal injury legal team. Darren A. Miller is the owner and founder of D Miller & Associates PLLC, as well as an experienced Texas Personal injury lawyer himself. Attorney Darren Miller received his Bachelor of Science from Texas A&M University in 1992 after which he attended the University of St. Thomas and received a Masters in Business Administration in 1993. 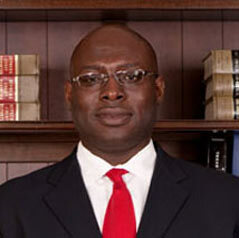 Mr Miller was awarded Juris Doctor in 1997 from Texas Southern University Thurgood Marshall School of Law. In 1998 he began a solo practice, D. A. Miller & Associates and in 2001 became a named partner in the law firm of Matthews, Easley and Miller. In August of 2002, Darren Miller realized his professional goal by building the law firm of D. Miller & Associates, PLLC. dedicated to helping victims of injuries and accidents. University of St. Thomas, M.B.A.
Texas A & M University, B.S. Texas Southern University, Thurgood Marshall School of Law J.D.